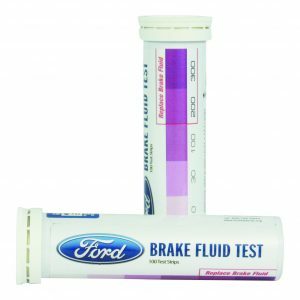 St. George, UT: Phoenix Systems has just announced a licensing agreement to produce and market Ford-branded brake fluid test strips. The most interesting aspect of the test strips is the innovative thinking behind them. Though automobile brake lines are made of steel their bores are coated with copper, which eventually deteriorates and contaminates the fluid. The test strip alerts you to the degree of contamination, if any. A brake fluid test strip takes seconds to conduct, provides proof of a needed brake fluid service and often results in additional business for a shop. If, indeed, the fluid needs to be renewed there’s the added benefit that, during the process, evidence of frozen calipers, torn seals or seized ABS units might be detected and addressed. Brake fluid is regularly renewed in race cars, particularly road race cars though less so in passenger cars. However, the practice toward regular checks is gaining ground. Motivated by a simple color test that takes approximately 60 seconds to mature, it provides a visual indication of brake fluid health. Phoenix developed the Ford product with the understanding that the brake fluid test needed to show the exact condition of brake fluid—no more guessing. Changing brake fluid when appropriate halts corrosion, extends the life of brake parts and improves safety. Background: Phoenix Systems originally blazed their trail in brake bleeders and more recently introduced the reverse bleeder, which was also licensed under the Ford brand name. A one-person operation the reverse bleeder is a light, portable device that bleeds brake and clutch systems in fewer than 10 minutes. In a new agreement, S&E Distributors has agreed to begin distributing the Coolant + Brake Fluid Test Strips available from Phoenix Systems. 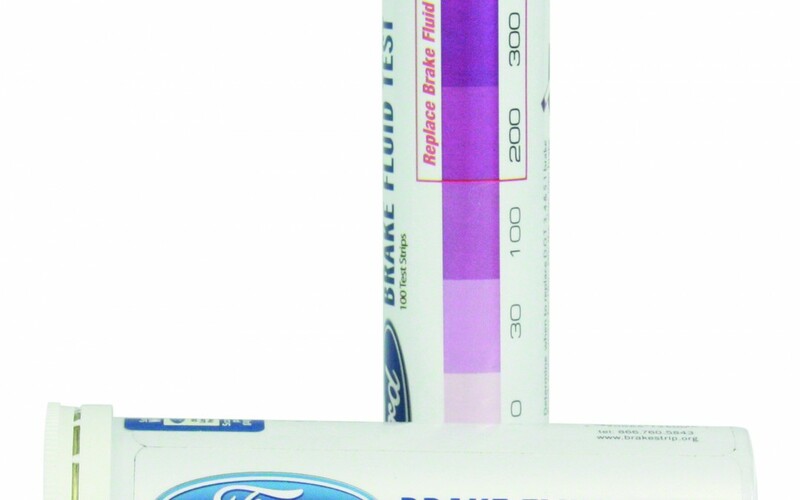 These test strips allow shops to test both coolant and brake fluid quickly and affordably when servicing customer vehicles. St. George, UT (PRWEB) January 01, 2016 — S&E Distributors will be offering a new product to their customers in 2016 with the addition of Phoenix Systems’ Coolant + Brake Fluid Test Strips, an innovative product that provides a cost-effective way for shops to test these important fluids and provide customers with better service. Through the distribution agreement, S&E Distributors will be offering the test strips to its quick lube and auto repair companies throughout the United States. Through the agreement S&E will be offering its customers Coolant + Brake Fluid Test Strips, a double-ended test strip that tests both coolant and brake fluid to determine if they need to be replaced. The strips provide automotive technicians with visual evidence of the quality of the fluid, increasing authority and customer service for them as they educate customers about the need for replacement. Get repair tips and tricks and 5% off your next order plus Free shipping on purchases of $60 or more. Thank you. Your coupon code is TAKE5TODAY We will send you a series of emails to introduce you to our products and provide repair tips. You can opt out of receiving our emails at any time.